The Poconos-Kittatinny Cluster is located in the rugged Delaware River headwaters of the Pocono and High Allegheny Plateaus. 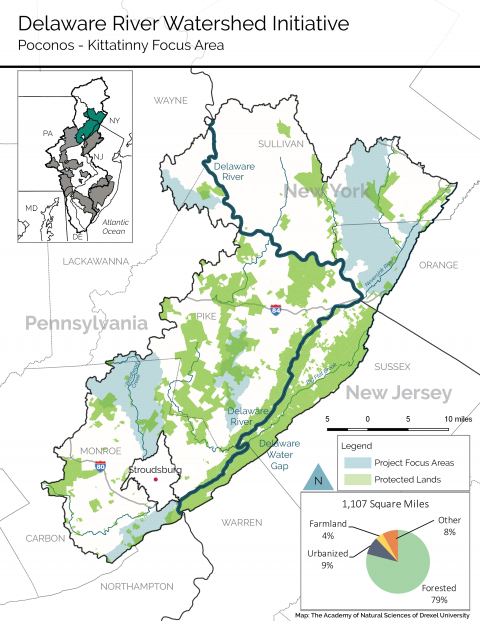 It represents approximately 10 percent of the Delaware River’s drainage area, encompassing 1,107 square miles and parts of three states and seven counties, including portions of New York’s Catskills and Shawangunk Mountains, New Jersey’s Kittatinny Ridge and Pennsylvania’s Pocono Mountains. Population is approximately 322,000. Land is 79% Forested, 4% Farmland, 9% Urbanized and 8% Other Uses. 29% of the land is protected as public lands or in perpetual easements owned by land trusts. Because it lies within commuting distance of the New York metro area, the region has become a second-home and resort destination. Tourism is a major economic driver; in some areas, the population triples in summer. 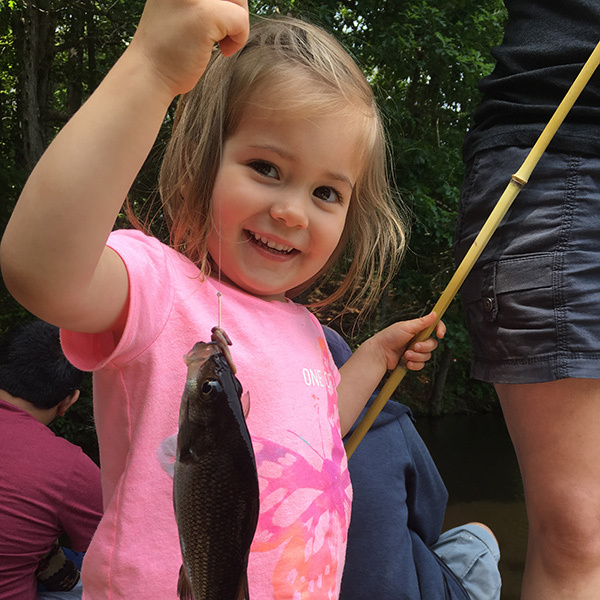 The region’s extensive woods, wetlands, and streams – home to native brook trout and abundant wildlife – are critical to protecting both local and downstream water quality and quantity. Total Area 1,107 Sq. Mi. Miles of new gas and transmission lines traverse protected lands, fragmenting forests and crossing streams. Population growth brings development that, if poorly planned, can harm forests, wetlands, headwaters, and floodplains. Development projects are often reviewed in isolation, without consideration of their cumulative effects on water quality and quantity. Climate change is affecting forest health, altering forest species and encouraging the spread of invasive plants and insects. The cluster’s abundant forests and wetlands are critical to protecting water quality and quantity in the Delaware River. The Poconos region has been developed as a resort destination for surrounding metropolitan areas, and tourism is the single-largest economic driver. People who commute to New York City and northern New Jersey have flocked to Pennsylvania’s Pike and Monroe Counties, which have experienced significant increases in the number of permanent residents. This makes land protection essential in an area where rapid and poorly planned development is a growing concern. Population growth has brought challenges as well as opportunities to this region. Local businesses and leaders often rely on development projects to provide jobs and revenue, but the degree to which land use and development decisions protect water quality varies with the local application of land-use law and design and engineering principles. Municipal officials must act upon development applications relatively quickly and may not always have the time and access to the technical resources needed to fully consider a project’s water-quality impacts. In addition, projects are usually reviewed individually without a way to measure the cumulative impacts of multiple projects on water quality or the potential economic impacts of reduced water quality in the region. New energy infrastructure and shale gas development pose another critical threat. Inappropriate siting, construction and management of facilities and rights-of-way, especially for electric lines and gas pipelines, can have both immediate and long-term impacts on water quality. Once cleared, rights-of-way historically have been maintained by removing vegetation and suppressing regrowth with chemical treatment, which impedes natural processes for reestablishing forest cover and increases erosion and sedimentation in local streams. The groups are permanently protecting lands through donations and purchases of properties or easements and helping landowners manage for forest health. Pilot projects will focus on restoring wetlands and floodplains. Technical assistance to municipalities will deliver land-use planning tools, and workshops for local planners will emphasize opportunities to protect water resources. Monroe County jurisdictions will get help in installing green stormwater infrastructure. The groups will promote the economic benefits of open space and help residents advocate for conservation. Accomplishments to date: In the past four years, the partners have initiated projects that will conserve more than 9,000 acres of land and monitored 42 sites for water quality. Thirty-one municipalities benefited from zoning and ordinance assessments. Four municipalities moved towards revising codes to protect water quality. Partners also facilitated a successful $2 million municipal open space bond initiative and secured $450,000 to help landowners implement conservation-friendly practices on their lands. Projected outcomes: The partners aim to protect 10,000 acres of forested land over the next three years. Restoration activities on protected lands will reestablish at least one mile of forested riparian buffer and restore 60 acres of wetlands. At least 60 landowners will develop new forest management plans or adopt conservation practices. Eight towns will update their ordinances or land-use planning documents to protect water quality. With robust monitoring and complementary research, improvements in land use and land protection will offer insight into the relationship between conservation and water quality, and provide the rationale for investment by downstream water utilities in source-water protection in the cluster. With a focus on maintaining the existing high water quality, monitoring will look for a stable signature—no change in water quality or degradation—in biological and chemical indicators associated with stream health. Macro-invertebrate and water chemistry monitoring will take place at approximately twelve locations, pairing sites upstream and downstream of land protection projects. Cluster organizations will collect fish samples as well as data on salamanders and algae. Watershed models will provide insight into the potential degradation averted through the permanent protection of key forest areas that may otherwise have experienced significant development. The cluster organizations are collaborating with Monroe and Pike Counties in Pennsylvania, and Orange County in New York, to obtain water-monitoring data to extend the range of sites, and will inform them of the Initiative’s activities. Partners will work with local leaders to assess opportunities for municipal open space bond measures. A “1% for Nature” program will give customers of local businesses the opportunity to make voluntary contributions that help protect land in Monroe County. 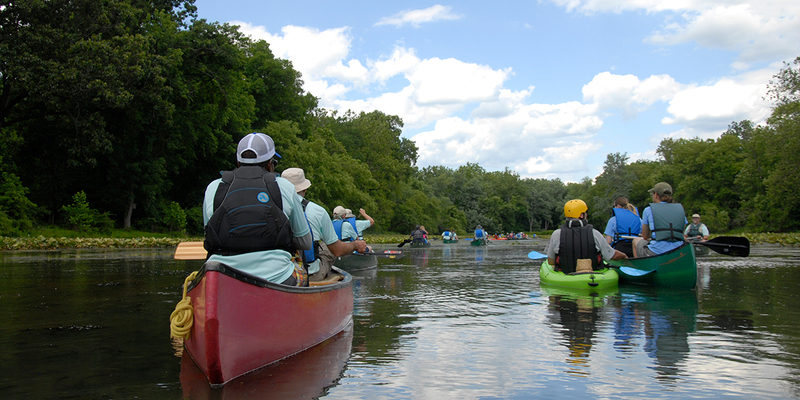 Brodhead Watershed Association, Delaware Highlands Conservancy, East Stroudsburg University, Natural Lands, Orange County Land Trust, Pinchot Institute for Conservation, Pocono Heritage Land Trust, The Nature Conservancy–Pennsylvania. Our mission is to protect the rivers and streams that provide drinking water for more than 15 million people across four states.